Since 1979 and the reforming of the club, Tubber GAA has achieved a huge amount both on and off the field. The folklore of Tubber GAA is a long and interesting story with all the ups and downs one can expect from a small rural parish GAA club. But it is the size of our club that is our greatest strength and working as a community with a huge fighting spirit we have achieved many great things on the football field even though we are still only a relatively young club. From the outset of the club people were always very forward thinking around the parish. There was great belief in the quality of the teams that donned the black and orange jerseys, even in those early days. However like anything it took time and experience before we could see any signs of success. From the start our club was always there or there abouts. 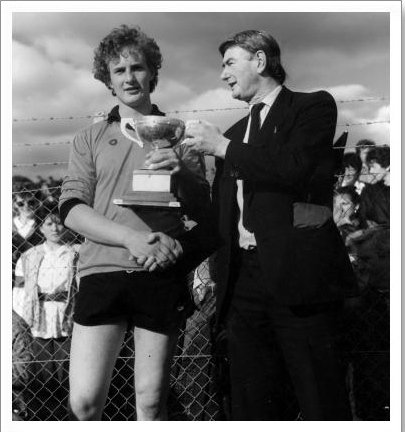 1983 and 1984 saw us lose out at the penultimate stage of the championship with defeats to Edenderry and Tullamore respectively, but there certainly was waves starting to ripple throughout the area and in 1986 all the hard work and efforts paid off. Like the previous couple of years things started off badly for us, but when we defeatedMucklagh after a replay matters started to look up with us earning a much deserved semi final clash with Kilcormac. Expectation was high in the village and the community really got behind the team now. In a pulsating match we defeated Kilcormac and earned a place in the clubs first ever Junior Final against near rivals Doon. The scene was set, bunting hung across every corner of the village, with flags blowing freely outside every house and on Sunday 12th October 1986 all roads lead to O'Connor Park, Tullamore. In what was a fast flowing game, it came right down to the wire, but on the day it was thanks to a rocket of a penalty from Paddy Sheridan three minutes from time after Eamonn Kavanagh was pulled down in the square that sealed victory for a Tubber side whose team commitment saw them overcome a fancied Doon side. It was Doon, who raced into a 1-2 to no score lead after eleven minutes, but it wasn't long until Tubber came into the game and thanks to scores from John Moran, John Rafferty and Willie Colgan, Doon only held the slightest of leads at the break. The second half had more yet to offer and thanks to three scores in quick succession from Paddy Sheridan only one point separated the sides 1-4 to 0-6. However Doon battled back bravely and right at the death it looked like the game was going to go Doon's way, but up stepped Paddy Sheridan to net the winning penalty.The final whistle rang soon after which sparked scenes of untold joy from the Tubber supporters. Tubber ran out winners on the smallest of margins, 1-7 to 1-6. Tom Colgan, Eddie Rafferty, Padraig Moran,Aidan King,TJ Kelly, John Moran (0-1),Willie Colgan (0-1), Pat Doolan, Cormac Kelly, Noel Robbins, John Rafferty (0-1), Chris Daly, Paddy Sheridan (1-3), Padraig Farrell (0-1), Syl Nestor. Subs: Eamonn Kavanagh, Joe Lowry, Jim Lowry, Declan Fox, Pat Egan, JJ Colgan, Tom Rafferty, Kevin Higgins, Martin Heavin, Joe Grennan (Jnr), Pat Egan. Management: Frank Egan, Oliver McManus, Dinny Wynne, Tom Nestor (RIP). 1987 saw more success come to the club when we lifted the Intermediate Cup on 9th May following an extra time win over St Brigid's, and for sheer excitement alone this was a cracking game of football. Bridging a five point deficit at the break, we went onto a deserved extra time 2-16 to 2-8 win thanks to a Paddy Sheridan rampage! From there our club went from strength to strength and in September 1988 our third piece of silverware came to the club when we pulled off a thrilling one point win 2-8 to 1-10 over St Columba's in O'Connor Park, Tullamore. 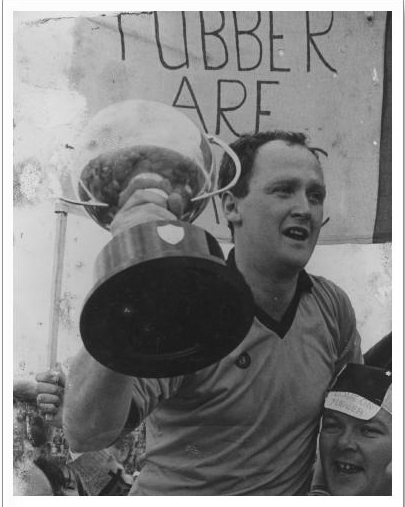 It was Tubber who had to withstand a Columba's revival, which saw the side from outside Durrow come back from a seven point deficit to end up only one in arrears, but despite that the Tubber resistance that had been so strong since 1986 won through in the end. 1988 was yet another glorious year for the club, when we lifted the Senior B Title at the expense of Cappincur, turning ourselves from a Junior club to a Senior one in the space of four wonderful years. O'Connor Park was the venue once more when we took to the field and with the smallest of margins to spare, 0-8 to 0-7, history was made as we completed our dramatic rise through the ranks in Offaly football. It might not have been the best game of football ever witnessed, but it certainly set out all the warning signs for the rest of the county, with us defeating the firm favourites for the title. But our Junior's were back in 1991 facing Drumcullen in the Final and it turned out to be the latest in what had become a steady string of successes for us. On the day, we were the faster team and our ability to use the ball was what gave us the beating of Drumcullen. Our two goals early on proved to be the winning of this game for us, with the 1990 disappointment a distant memory.The final scores read 2-7 to 1-7. 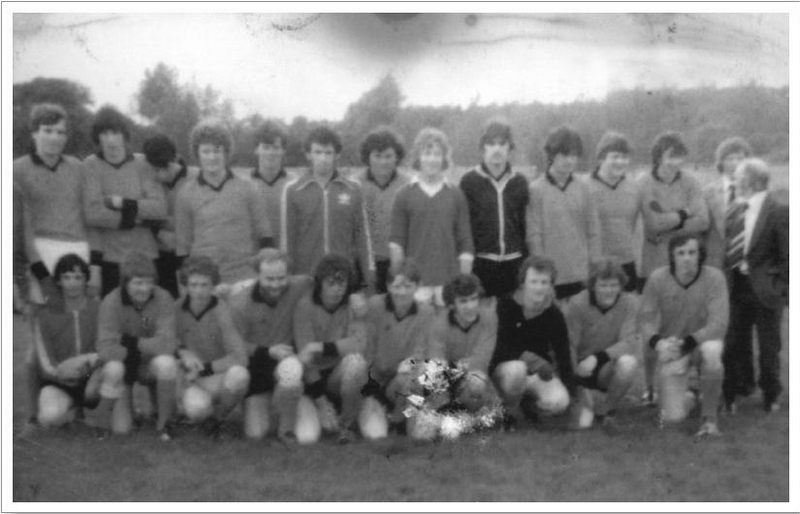 1991 also saw our Seniors clocking up one of the biggest achievements, when they took to the field against the reigning County Champions Ferbane. It might have been early to be celebrating, but for a club who had only won a Junior Title in 1986, to take to the field against Ferbane and beat them was deemed the shock of the championship. 1992 saw us reach our first ever Senior quarter final. However inexperience cost us as we were beaten by Tullamore and from there it really unfortunately became a trend for the next number of years. For the next two years Killeigh/Raheen defeated us, but a young trend of players started to emerge and 1993 saw Ciaran McManus make his debut in goals no less. 1995 failed to bring championship success to the club, but we did win the Division Two League defeating Ballyfore, but unfortunately from there our days on the senior playing field weren't fruitful.From 1996 to our relegation to Intermediate status in 2000 we managed to only win three games and relegation was inevitable in 2000 when we lost all our group games. Our first year back at Intermediate Level didn't go according to plan and we failed to qualify, but in 2002 we did make it to the quarter final stages only to be beaten by Clonbullogue. 2003 and 2004 were years to forget as we performed poorly in the championship and things began to look ominous. But in 2005 a new younger generation of players emerged to greatly add to the team. In 2005 after winning two group games against Tullamore and Rhode and drawing with St Rynagh's we found ourselves in the play off with St Rynagh's again to see who would top the group. But it was St Rynagh's day and we were drawn against Clonbullogue in the quarter final of the Intermediate championship.We ended up beating Clonbullogue in the quarter final. For the third time we faced St Rynagh's and once again they beat us and went on to win the Intermediate title. But 2005 was not totally lost.We did bring home some silverware in the form of the Division Two League Title defeating Raheen by 2-9 to 1-7. It was a powerful first half performance that saw our boys over run Raheen so much so that we lead by 2-7 to 0-2 by the half time break and despite a strong comeback from Raheen in the second half it was our day. 2006 came around very quickly and this was the year that the club had waited for. In the group stages we defeated Birr and Rhode only to lose to Bracknagh, but we had our chance in the play off to avenge that defeat and that we did, beating Bracknagh by sixteen points to line up a semi final clash against Birr.We defeated Birr and found ourselves back in a long awaited final. In what was a much anticipated final all roads lead to O'Connor Park on Saturday 14th October and thanks to sensational displays from Joe Higgins, Ciaran McManus and Brian Kelly, the Intermediate Title made its return to the village for the second time. In the end three points separated the sides 1-11 to 1-8, but in reality it was all Tubber and thanks to a wonderfully struck goal from Brian Kelly the game was ours from the off and as they say the "Cat was hopping for days"! From there we had another wonderful couple of months representing the county at Provincial Level. Up first was the meeting against the Wicklow Champions Ashford and in what was a wonderful display we ran out convincing winners 3-11 to 1-6 to book a quarter final clash with Fingal Ravens from Dublin. Played in Tubber it was a case of the home side's simply outstanding defence quelling anything that Raven's had to offer and thanks to a wonderfully struck goal from Michael Grennan we booked a semi final clash against near neighbours Bunbrosna. It was a much stiffer test as expected. Having lead most of the way through the game it was looking like the momentum was falling by the way side, but a superbly struck penalty from Ciaran McManus saw us book a place in the final.The final score was 1-8 to 0-8. On Sunday 10th December 2006 we took to the roads again, this time to Lexilip where we took on Confey in the Leinster Final, but it wasn't to be our day with Confey winning 3-7 to 1-8. But what a year 2006 was.Since then we have competed at Senior Level and since our return to the highest rank we have featured in the last three county quarter finals only to be defeated by Rhode, Ballycumber and Shamrocks respectively. Our Junior C Footballers also have featured predominately in the past couple of years but unfortunately despite reaching the County Semi-final in 2007, League Final in 2008 and Final in 2009, silverware has alluded us.